Want to learn how to make slime with baking soda? Slime is one of my kids’ favorite things. 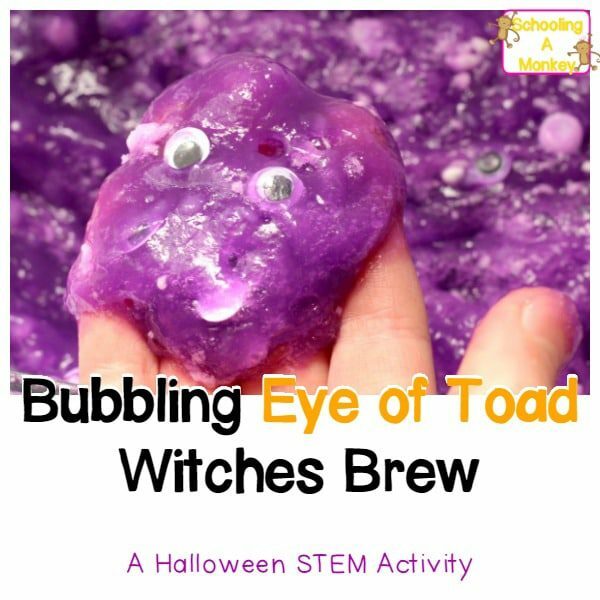 They love the stretchy, gooey, and fun (as well as STEM learning) that slime provides. We’ve made a lot of slime recipes, and we almost always make slime for any upcoming holiday just for fun. 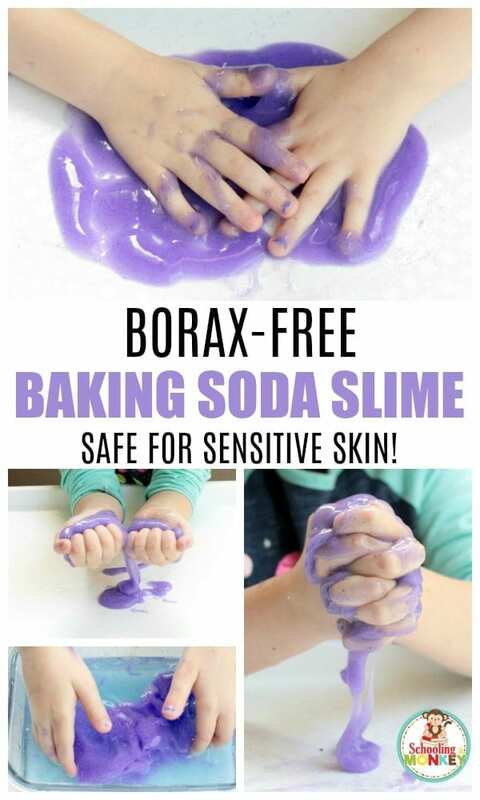 Borax and liquid laundry starch are the two most common thickeners for slime, but some kids (and adults) are sensitive to Broax (laundry starch also has Borax in it). A borax reaction can cause itchy, dry, red, and peeling skin. For kiddos with more sensitive skin, alternative slime recipes must be found (like this delicious taffy slime or magnesium slime!) and this slime with baking soda. For Earth Day, we made a version of slime that uses baking soda as the thickener, and the kids loved it. 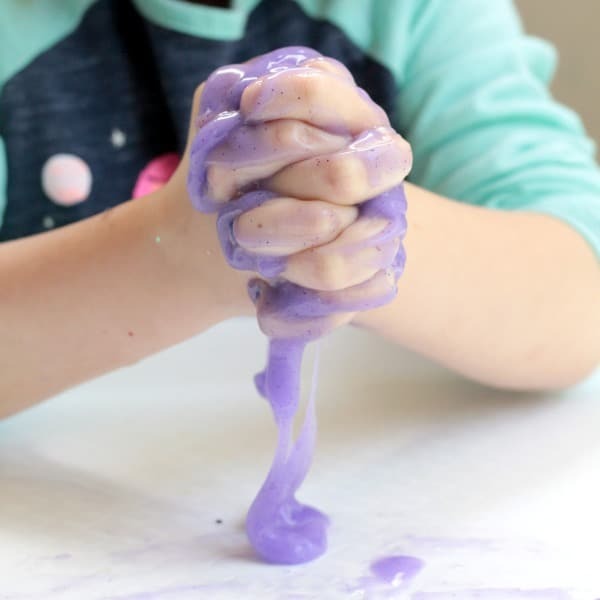 This baking soda slime is a little messier than traditional slime, but it’s a blast to make a play with and you don’t have to worry about it irritating the skin. 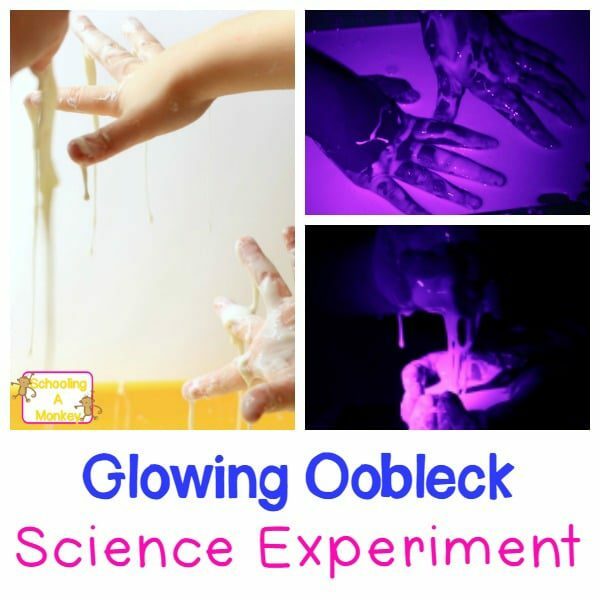 Learn how to make slime with glue and baking soda below! Read on to see how to make the very best slime for sensitive skin! And don’t forget to try our other non-traditional slime recipes: candy slime, fluffy slime, and xanthan gum slime! Traditional slime is made when boron mixes with the polymer chains in the glue, creating strong, but flexible bonds between the molecules. But slime made with baking soda is a little different. 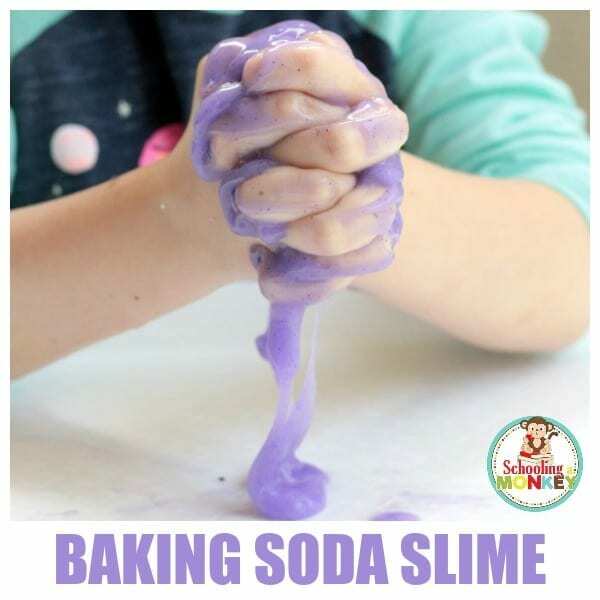 When you learn how to make slime with baking soda, you’ll find that the ingredients in the baking soda bond with the glue to create a slime that is softer, stretchier, and a bit stickier than traditional slime. 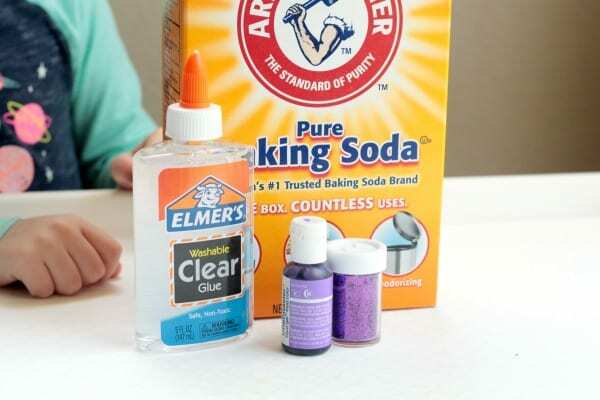 However, because most kids don’t have any sensitivities to baking soda, you can use it even with toddlers and preschoolers who might put the slime in their mouths. It won’t taste good, but the non-toxic slime ingredients won’t hurt the kids at all. If this is your first time making slime, you should follow along with our post on slime troubleshooting. Liquid laundry starch slime made with clear glue is the easiest slime recipe, but the baking soda slime recipe is pretty easy to make too! You will want to make sure you’re making this slime on a tray or plate, to have something to catch the slime. Don’t make the slime anywhere near carpet, and make sure kids are wearing old clothing that you don’t mind washing. If you do get the baking soda slime in hair or clothing, it will wash right out with warm water and soap. A trip through the regular washing machine cycle will get slime right out of most clothing. And getting it out of hair is as simple as washing with shampoo and conditioner. Follow along with our directions below to learn how to make slime with baking soda! 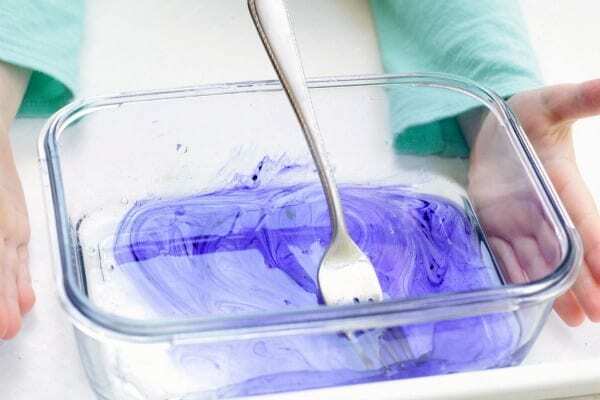 Follow these directions and you’ll have the best slime with baking soda ever and learn just how to thicken slime with baking soda. 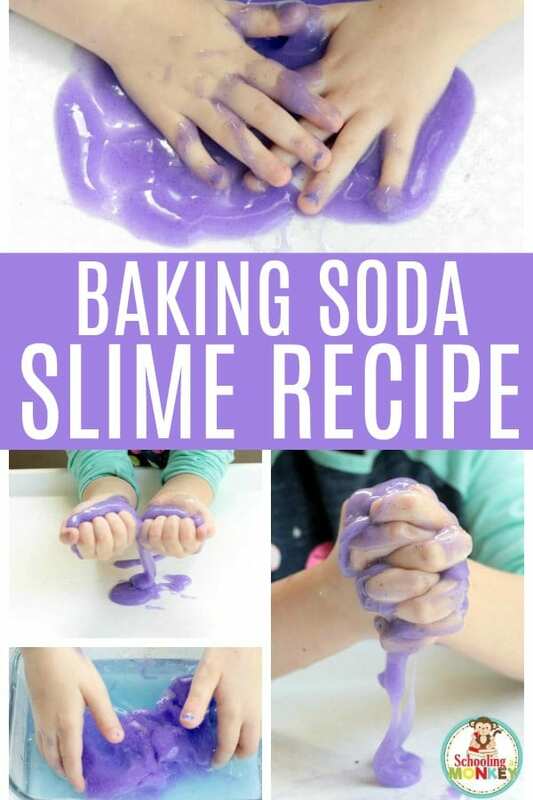 This baking soda slime recipe is a wonderful alternative to slime made with borax, slime made with laundry starch, and slime made with contact lens solution. 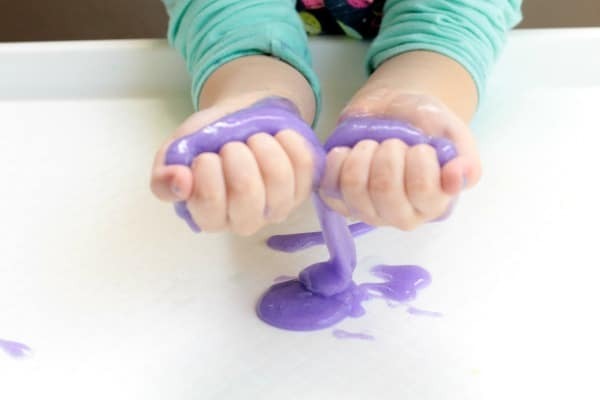 You can make this slime quickly and easily, and the baking soda slime has a much “slimier” texture than some of the other slime recipes on the Internet today. 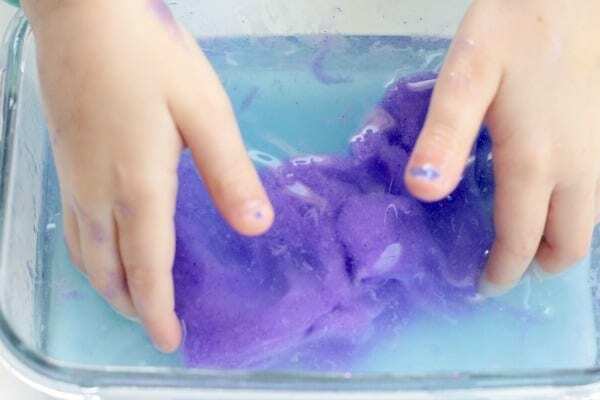 This slime recipe with baking soda is not quite as stretchy as traditional Borax slime. In fact, it reminds me of the gooey slime that Nickelodeon would always dump on people. The nice thing about this slime, however, it that it is SUPER easy to clean up out of clothing and the carpet. However, we recommend playing with it at the table and not around carpet or furniture. Learn how to make slime with baking soda below! Mix 1/4 of a cup of baking soda into two cups of warm water and set aside. In a second bowl, mix 5 ounces of Elmer’s clear glue (it must be the clear glue) and your chosen color (we did purple). Pour the glue mixture into the bowl of baking soda water. The slime will start to form little balls in the water. Fish these out, and you’ve got slime. Work the slime between your fingers to create a slimy, sticky texture. If you want to be able to pick it up without it sticking to your hands, dip your fingers into the baking soda mixture. You can also add the slime back into the baking soda water if it loosens up too much. This slime isn’t recommended for toddlers, as they might try to eat it. 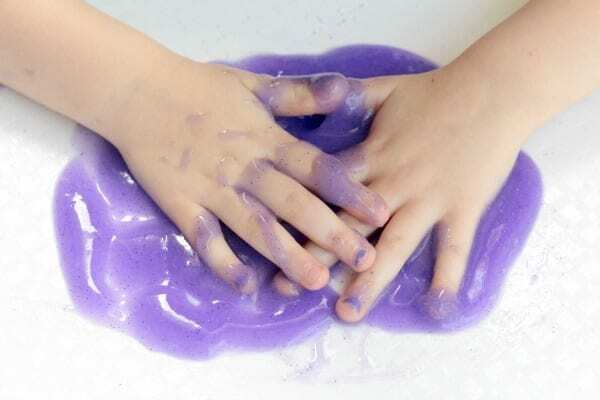 This slime is perfect for using as a writing tray, or just for sensory, messy fun. 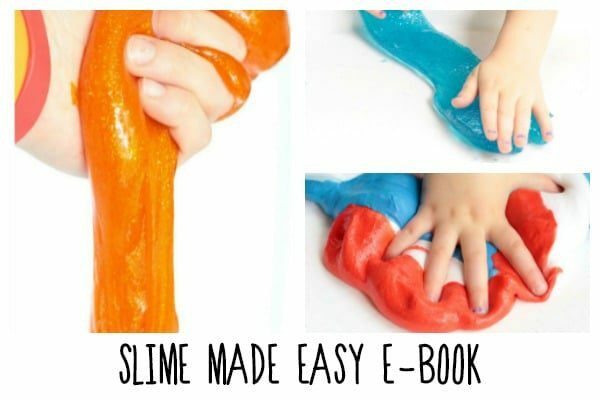 Kids will love the sticky, gooey texture of this slime. My preschooler especially loved the squelchy sound it made when she squeezed it between her fingers. When your slime starts to get runny again, add more of the baking soda water to turn it back into slime. 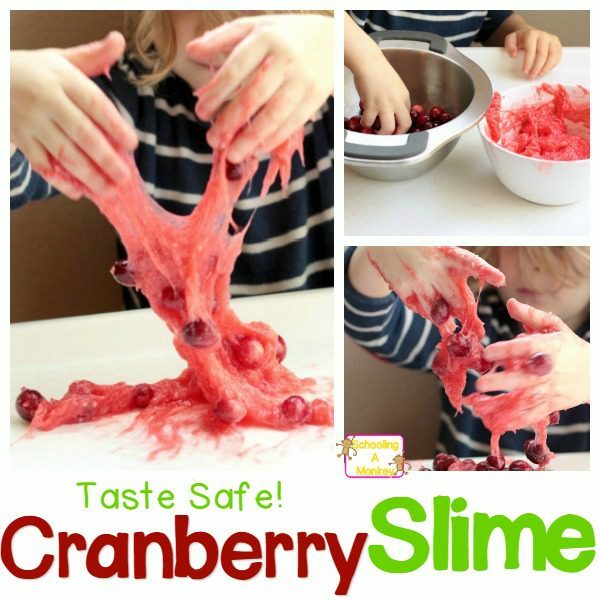 The baking soda slime recipe does not last as long as some other slime recipes, but it’s easy to clean up and kids who are sensory seekers will love the sticky and gooey feeling more than that of a few other slime recipes. Try these other borax-free slime recipes! 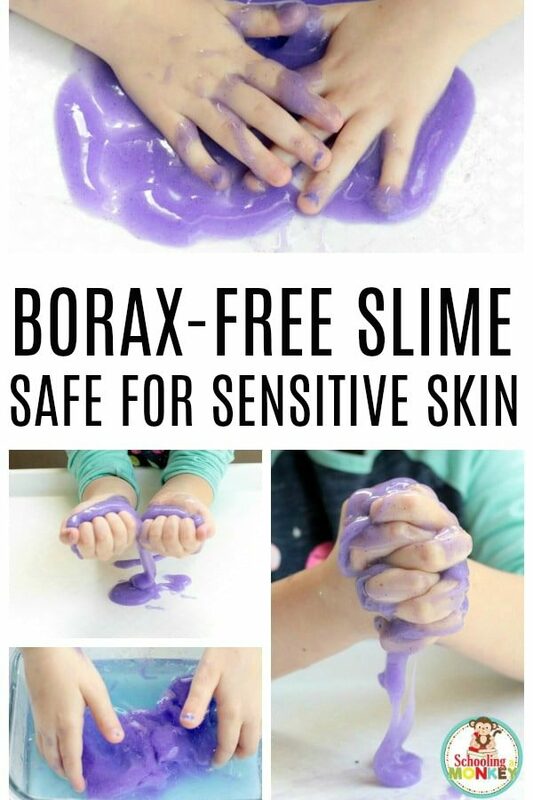 It is possible to make slime without any borax or boron chemicals.